It’s gorgeous outside. What a perfect time to shoot a round of golf. And the bachelorette party for Aunt Matilda needs to be planned. Hey…that YouTube video on growing Norwegian potatoes looks sorta interesting! In fact, anything other than work looks interesting. Sound familiar? Have you ever dawdled through days? (Weeks? Months?) Let’s talk about how to fire up the work engine when you’re ensconced in ennui. We could deal with the deep, systemic issues that are dampening your enthusiasm. Diagnose what ails your spirits and prescribe a long-term cure. Something like tying your work to a higher purpose, or systemizing your processes to reduce overwhelm or booking an appointment for a CT scan—oh, wait, we got distracted again. Anyway, let’s skip the serious, enduring remedies. Who’s got the energy to tackle profound changes? What we need is something instant. An EpiPen®. Jam it in our thigh and, bang, we’re in motion again. Find an Energy Buddy —someone who tends to be enthusiastic and, in case of emergency, will push you to follow the usage directions outlined below. Grab a sticky-note. Big enough to write a few lines of text but small enough that it won’t cover your computer monitor. Write down a single, business activity that is absolutely easy and rewarding for you. It doesn’t have to be productive; just enjoyable. For example, a consultant I guided through this exercise recently said writing came naturally and was gratifying. Write down another business activity that is easy and rewarding. The consultant I just mentioned gravitated toward doling out advice on industry blogs. Write down a third activity that attracts you. In this case the consultant proclaimed he likes to build things. 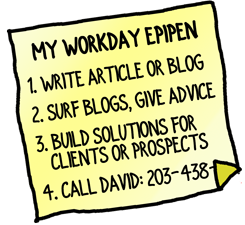 Construct your Workday EpiPen by writing the three activities you chose, followed by your Energy Buddy’s phone number. 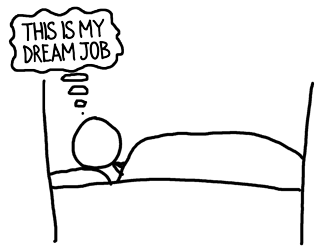 You’ll have something like the illustration below, which you’ll then stick on the edge of your monitor. Step 0 – Only if necessary, call your Energy Buddy and share your predicament. You’ll know you need to make this call if you’re just too… yawn… listless to even make it to Step 1. Step 1 – You have permission to engage in the first activity on your list for 30 minutes. Set a timer and have fun. After half an hour, are you in motion? Feeling energized enough to get moving on some “real” work? If not, move on to Step 2. Step 2 – You have permission to spend up to 30 minutes enjoying your second activity, whatever that is. If you’re not back in the work groove when the time expires, continue with Step 3. Step 3 – Enjoy your third activity for up to 30 minutes. By this time, you’ve spent 90 minutes in action and working. Chances are you’ll be ready to turn to the most important task on your to-do list. But if you’re not, proceed to Step 4. Step 4 – Take your Energy Buddy out for a beer. Look, if you’re intent on procrastinating, at least have fun with it. Why sit around in your office if you’re unproductive anyway? There’s always tomorrow to learn about Norwegian potatoes. What goads you into motion when you’re lethargic? I’d like to know. Please share your thoughts in the comments box. Hahaha! I received this email while trying to sweat out a 1000-word newspaper article about a local zoning violation. This even makes vacuuming look appealing. So your email was a welcome distraction. I would like to see some tips about motivating yourself when you’re on a severe deadline. I don’t have 90 minutes right now to play around. Thanks. Patty, give yourself 30-minute breaks now and again. Sprinting for days on end (or even hours on end) burns you out and leaves you less creative, productive and valuable to your clients. That said… get ‘er done! Surely there’s something interesting about local zoning violations. Find that unique twist or way to build your personality into the article. Perhaps that will make the task a tad more enticing. Thanks for testifying to the effectiveness of the technique, Thom. Everyone has dreary days when work is a drag. You show that it’s possible to escape the doldrums and fill your sails with new energy. I have the same situation as Patty. I’m on a serious deadline and yes – even vacuuming would be more fun. I opened your email this morning for motivation to stay focused. Thanks for a perfectly timed post! The good news is you’re busy! If all your work is tedious, then it’s time to examine the types of projects you’re taking on. If only some of it is boring, perhaps you can subcontract or delegate the dull parts. Good luck with the deadline! Great article! Coming off the holiday weekend, getting back to the grind is the last thing I want to do. This email came at the perfect time. Thanks! Wait, the holiday weekend’s over? I thought extended at least until Thursday. When the driveway’s buried in snow, the office is nice and cozy. This time of year, though, frolicking outside holds major appeal. Perhaps with the tips above, your major grind won’t be so grinding. Thanks for commenting, Calesha.